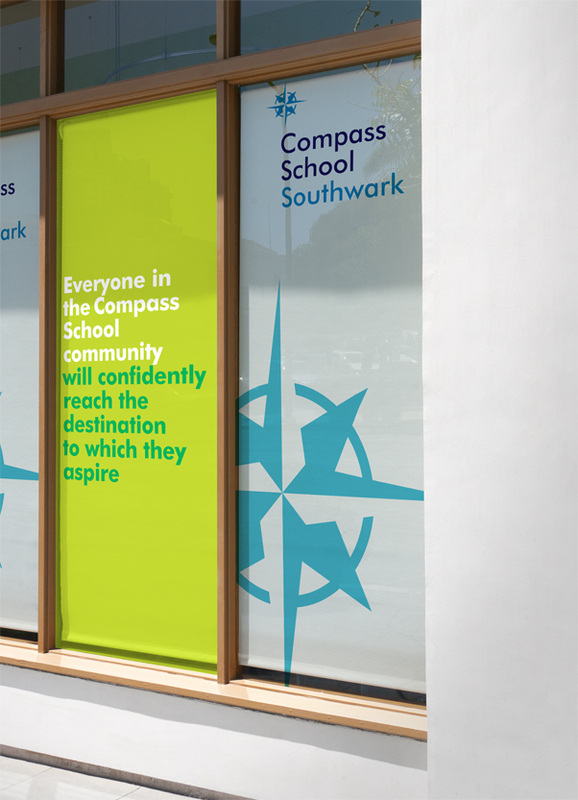 Compass School is a free school in Southwark, South East London, which opened in September 2013. Pupils are aged 11-16 and come from a diverse range of social and cultural backgrounds. The school is temporarily housed in an old college building while a new housing development and school are being built on the site. As a result the school is in a constant state of flux, regularly moving from one area of the site to another, so signage and environmental branding has to be portable. We started working with the school on their marketing and communications materials in June 2014 in preparation for the 2014-15 school year. The first step before any design began was to visit the school and explore the surrounding community to get an understanding of the culture, personality and environment. This was followed by a face to face briefing with the Principal. It’s essential to visit any organisation and meet key members of staff before you can create anything that accurately reflects the school and it’s unique characteristics. The school already has a badge which is used across the uniforms so we didn’t want to change that dramatically and consequently create a need for parents to have to unnecessarily have to buy anything new. We slightly tweaked the badge to refine it and make it a little more graphic and unique, but nothing that would create any continuity issues with existing materials. In terms of the branding we developed basic design guidelines including a colour palette and typefaces to ensure consistency of brand implementation across all materials. We presented three concept options for the website and prospectus in response to the brief. Following the presentation they chose their preferred design direction with some tweaks and a bit of ‘cross fertilisation’ between the different concepts. Following our development and sign off we sourced and managed the prospectus printing through to delivery, and the website build and programming. The website is built around a standard WordPress content managed site so that it can easily be updated by the school staff and they are not tied to one website developer in the future. In addition we produced some portable and temporary signage for the reception area and banner stands for use at open days and events. 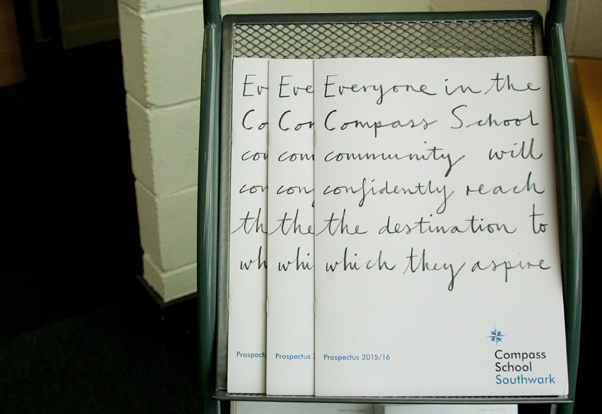 We focussed all materials on the school’s vision statement – “Everyone in the Compass School Community will confidently reach the destination to which they aspire”. All materials are designed to feel inclusive and reflect the community with the inclusion of quotes from parents rather than feeling too institutional and cold. The structure and functionality of the website is straightforward and accessible to encourage use by parents. The website and prospectus both work on two levels with key information and statistics pulled out to give an at-a-glance overview with the text providing more in-depth information and details. The website is structured to allow users to easily access the information they are looking for quickly and easily. 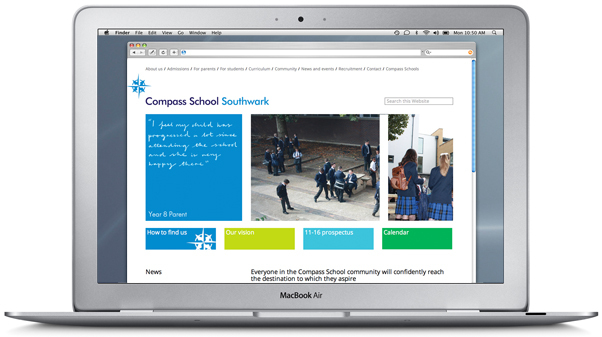 We will soon be starting work with Compass School on the next phase of their brand development and their new marketing materials for 2015-16. 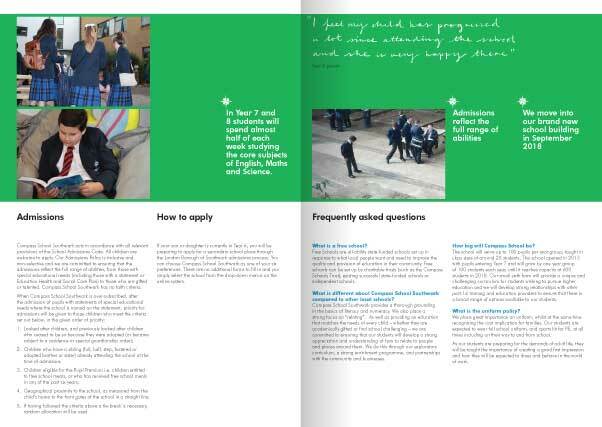 Further tips and advice on marketing and branding for schools and colleges can be seen here. The branding and marketing of schools and colleges is yet another thing that’s been added to an ever increasing list of things that Headteachers and Principals now have to manage. Chances are that it is not a specialist area for most people in these roles, so where do you start? Howdy work with organisations, including schools and educational establishments, to create and build strong, distinctive brands and effective marketing materials. We realise that most schools don’t have in-house communications specialists so we help with all aspects of the marketing and communications planning through to the execution and delivery. We’ve put together some simple tips below to help guide you through the process. It’s important to think carefully about the reason behind the decision to review the branding or marketing materials.Do you need a new brand, maybe to shift perceptions following a change in the organisation, or is it simply that your existing communications are looking tired and in need of a refresh? It may sound obvious but this initial goal is often forgotten in the process resulting in the project drifting away from the original aim. This should dictate the nature and scope of the project. Look at what you already have, if anything, and how much needs to change. Do you need a revolution or an evolution of your branding and marketing communications? A rebrand doesn’t have to mean throwing everything that you have in place away and starting from scratch. What are the positives and the negatives of your current materials? An audit of existing materials and their effectiveness is an important starting point. What are the outcomes that you need to achieve? Decide on the key messages you need to communicate and who with? This may need to be segmented into slightly different messages for different audiences. What is the purpose of your communications? These will form the core of your design and marketing brief to ensure that you end up with an appropriate communications plan and deliverables. See our five tips for writing a design brief for more help and advice. The diverse audience you need to communicate with is a challenge in itself. Engaging parents, students, trustees, governors and sponsors, each with their own priorities, is difficult. Throw in other issues, like social challenges – maybe literacy levels or language barriers – and you have a challenging brief that will need to be taken into consideration and addressed in the design. The best way to find out what people do and don’t like is to ask them. Why try and second guess how parents would prefer to receive information when you can ask them? A small amount of basic research before the project begins can save a lot of wasted time and money developing something that people won’t use. This could be a few questions on your website or an email survey, or simply asking people in the playground face to face. By this we mean both time and money. It’s important that you have an idea of how much time staff can realistically commit to updating a website, social media, writing copy for newsletters, etc. This will ensure that your communications plan is appropriate and achievable. Of course it’s important to have a ballpark budget in mind. You’ll need to get quotes from companies to help guide this figure but don’t get sucked in by unnecessary whistles and bells that blow your budget without adding real value and benefits. Having clearly identified the scope, objectives and challenges first, it will be easier to stick to clear parameters. Before anything, you need a clear mission/vision statement, agreed by all stakeholders. This, no doubt, exists in your’s, and your colleagues’, heads, and will have been voiced at many meetings, but it needs to be pared down to a succinct written statement against which every aspect of your brand is measured. The brand is the embodiment of your mission so, without a clear statement, any investment in branding and marketing will be wasted. As well as the logo/badge, branding includes the colour palette, typefaces, tone of voice, style of photography, illustration, etc. which need to be consistently used across everything. Of course there are all the standard day to day applications such as stationery, signage, uniforms, etc. and, without exception, all schools and colleges need a website and prospectus which form your primary marketing materials. In addition, there is an almost infinite list of things that you can brand with your school badge or logo for marketing purposes, such as bags, pens, badges, etc. and it’s important to ensure that the things you choose, if any, are appropriate to your audience in terms of suitability, budget and effectiveness. It’s important that you work with someone that you feel is a good match for you and you’ll enjoy working with. There are many companies who design exclusively for the education sector who may feel like a safe pair of hands, but beware of template based design solutions. The whole point of design and branding is to differentiate and address your specific requirements and brief, rather than deliver a formulaic solution. 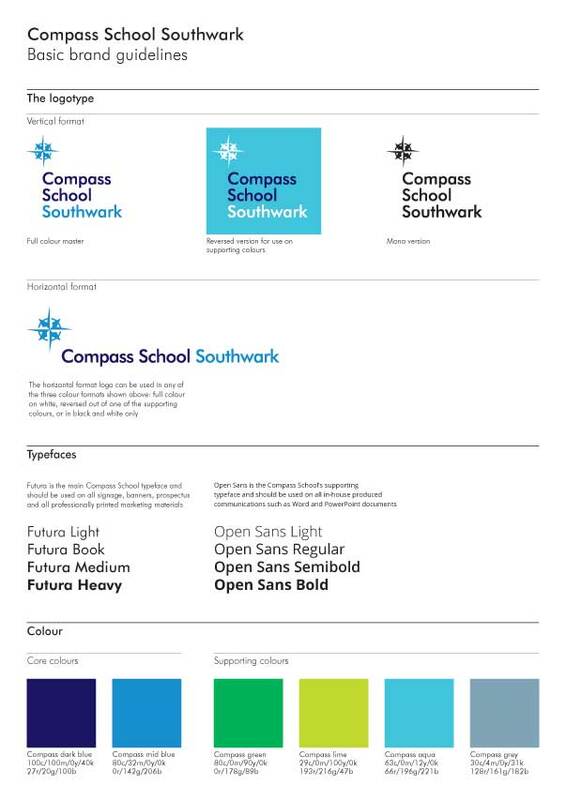 The image below, from one such company’s web portfolio, shows a selection of their ‘tailor-made’ designs for schools. No matter what your brief, I wouldn’t mind betting that at least one concept they present would contain a ribbon-like swoosh device on the prospectus cover and website. Having removed all the names from these there’s little to differentiate one from another. Of course there will be a number of commonalities across all school briefs, but the purpose of design is to make you stand out from, rather than merge into, the crowd. Our blog on choosing the right design partner offers more advice on this. 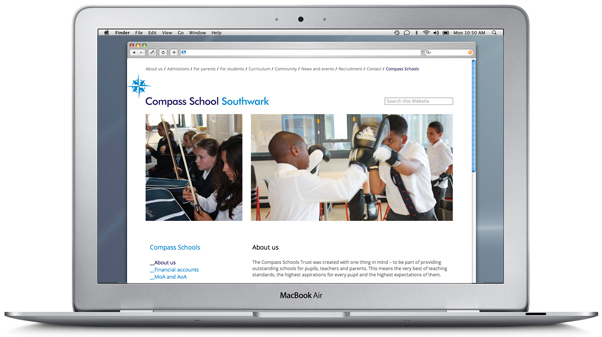 You might also be interested in our Compass School case study. We hope you found this useful but if you need any further help or advice feel free to get in touch.